EPA 34 MPG Hwy/22 MPG City! CARFAX 1-Owner, ONLY 26,066 Miles! Onboard Communications System, CD Player, Brake Actuated Limited Slip Differential, Smart Device Integration, Satellite Radio, EQUIPMENT GROUP 201A, SE MYFORD TOUCH TECHNOLOGY PACKAGE, Back-Up Camera READ MORE! Back-Up Camera, Satellite Radio, CD Player, Onboard Communications System, Smart Device Integration, Brake Actuated Limited Slip Differential. Keyless Entry, Steering Wheel Controls, Child Safety Locks, Heated Mirrors, Electronic Stability Control. SE MYFORD TOUCH TECHNOLOGY PACKAGE Reverse Sensing System, 10 Speakers, SYNC w/MyFord Touch, 2 driver configurable 4.2 LCD displays in cluster, 8 LCD touch-screen in center-stack, media hub w/USB Ports (2), SD card reader & RCA video input jacks, 5-way controls located on steering wheel and SYNC services (traffic reports, GPS based turn-by-turn directions, 911 assist, vehicle health reports (VHR) and information services), NOTE: SYNC Services available for a $60 annual subscription fee, Dual Zone Electronic Automatic Temperature Control, EQUIPMENT GROUP 201A Appearance Package, Leather-Wrapped Steering Wheel, Fog Lamps, Wheels: 18 Premium Painted Aluminum, Rear Spoiler, Tires: 18 All Season, TRANSMISSION: 6 SPEED AUTOMATIC W/SELECTSHIFT (STD). Ford SE with Ingot Silver exterior and Charcoal Black interior features a 4 Cylinder Engine with 175 HP at 6000 RPM*. 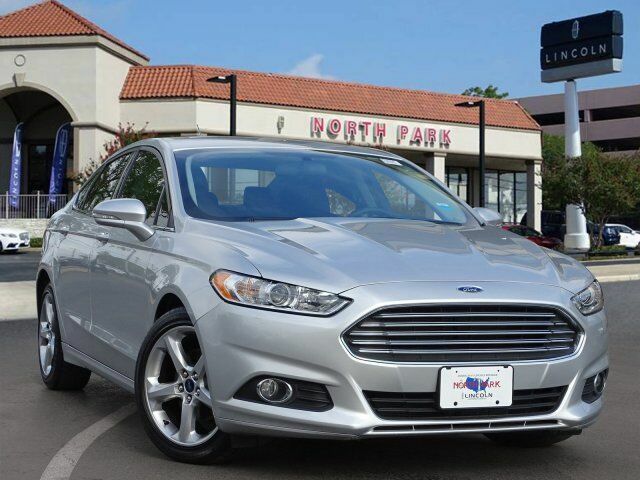 KBB.com explains Whether you want a sporty family car with Euro-sharp looks, or just a practical and affordable way to haul around five people, the 2016 Ford Fusion is a hard car to dislike.. Great Gas Mileage: 34 MPG Hwy.